The pet coke piles in Detroit, near their height earlier this summer. DETROIT (AP) - A company says it has removed piles of petroleum coke from Detroit's riverfront, but will need more time to haul away other materials from storage sites. 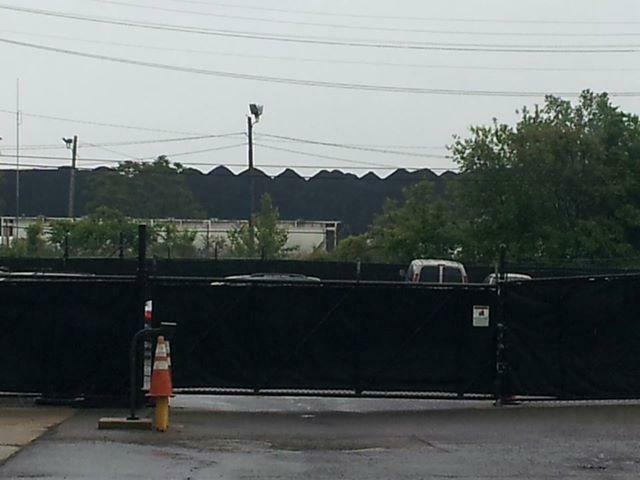 The city-imposed deadline for Detroit Bulk Storage to get rid of the petroleum coke is Tuesday. Spokesman Daniel Cherrin says the company has asked for additional time to remove limestone aggregate and that it may take until early next month to clear it all away. Bob Warfield, a spokesman for Mayor Dave Bing, says daily inspections show the petroleum coke was being removed. Petroleum coke -- also known as pet coke -- is used as a fuel and results from refining exports. The city pointed to health concerns as one reason to remove the piles from southwest Detroit. Limestone aggregate is a construction material. DETROIT (AP) - Mayor Dave Bing has issued a deadline for the removal of all petroleum coke from the Detroit riverfront on the city's southwest side. Bing's office says Detroit Bulk Storage was notified Tuesday to move the material by Aug. 27. The city says the company failed to cart away all the petroleum coke by an Aug. 9 deadline listed last week in an order from Detroit's Buildings, Safety Engineering and Environmental Department. Peters pushes for GAO to study pet coke "best practices"
Detroit Congressman Gary Peters wants the US Government Accountability Office to study petroleum coke. Peters has asked the Congressional investigative office to examine what are “best practices” for handling the substance, a byproduct of refining Canadian tar sands oil. Some petroleum coke is being stored openly at a site along the Detroit River near the Ambassador Bridge in Detroit.